HomeInsight IdMWill Role Management become the focus of Compliance? Will Role Management become the focus of Compliance? A few months ago, I wrote a post in which I took issue with the statement that “Role Management will become the focus of Compliance”. My objection kicked off a flurry of responses from various folks, expressing opinions that covered the gamut. I received a lot of responses disagreeing with me, with quite a few of those being from people in the role management business (no surprises there). To be fair though, some of them were quite balanced and articulate. Now, one thing I take great pride in is my being able to always maintain a business perspective of the IAM problem. I have never thought of it as an IT problem (but one that requires and impacts IT infrastructure). So I promptly challenged Maarten to duel for besmirching my reputation (Just kidding). Again, I have no argument with the statement that RM systems are “important” to achieving compliance, just with the notion that they are the focus. Roles have long been viewed as the Holy Grail of IAM – true role-based identity management will solve all problems. But like the Holy Grail, it is really hard (nearly impossible) to achieve. So I tend to have approach blanket statements with some perturbation. I don’t disagree with Roberta or Maarten on how important role management is to compliance. I just want the message to be balanced, and not get exaggerated to the status of “all important”. Looking at Maarten’s position, I agree with point (1), but disagree with (2) and (3). RM systems will not be able to do those because they present only a partial picture of the reality of a business. If I can simplify an example to make my point, it is fairly common for people to be given privileges in an ad-hoc, but entirely proper, manner. This is invariably done through a request-based, approval enforced mechanism that today is handled by provisioning systems (OIM, for instance). These privileges are therefore out of policy, yet are not exceptions. And a role management system should not have to deal with this kind of scenario (even if it could). Yes, compliance is the job of the auditor, but an auditor is only as good as the tools they are given, which is where the various IAM solutions come in. Auditors care about the roles because knowing the roles a user has tells them about what access the user has and does not have. But they also care about the out-of-policy privilege grants, and want to know that the correct procedures for approving, tracking and attesting those privileges are being followed. They care that audit trails are being maintained, and that there are no loopholes in the business processes. Another person sent me an email saying “Role management is vital method to achieve compliance while user provisioning is a method to deliver proper user- and permission-information to distributed environments and applications. (yes, UP also collects information from distributed sources for the centralized Role Management)”. This points out one of the main misconceptions that I have been trying hard to fight, and which is probably at the core of the misunderstanding of the space. Too often, provisioning is viewed simply as (to quote) “the bus to deliver this user-permission information, with all required attributes, to all those environments where it is needed.” This really is the IT-centric view. Provisioning systems today (OIM in particular) are actually much more of a business solution than an IT solution, providing rich policy definition and enforcement, and end-user and administrative request-based, approval driven tools for managing privileges in a fluid business environment. To me, role management is an essential part of IAM. In fact, in today’s environment it is probably the most important part of a compliance-driven IAM solution. It should not, however, be the focus of a IAM-based compliance project. Any good IAM strategy must be a mix of role-based, rule-based and request-based management (think of the old 80-20 rule, just broken down to 50-30-20), with a good overlay of audit and compliance tools. 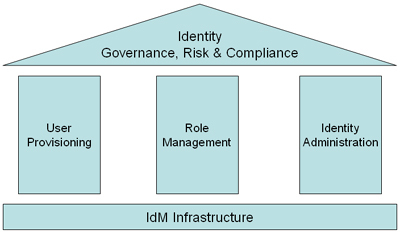 At Oracle, we feel that Identity Administration, Provisioning and Role Management are the three pillars on which (the newly emerging) identity GRC tools are overlaid to provide the foundation of a good identity audit and compliance practice.